I thought of beginning this post with ‘I can’t believe Thanksgiving has already passed!’, but looking at the amount of holiday leftovers that have overrun our fridge in the past week, I can’t help but believe that Thanksgiving 2014 is already behind us. So today I decided to post a recap of all of the delicious, cruelty-free vegan Thanksgiving recipes both Rob and I made to celebrate this holiday. This year, it was just the two of us at our Thanksgiving celebration. Because both of our families are too far away – Rob’s on the East Coast, mine in Russia – and the fact that we both are very introverted to make new friends easily, we realized early on that this Thanksgiving wasn’t going to be too crowded at our house, and made peace with that. However, I wanted to pull all the stops and cook a lot of traditional dishes anyway. 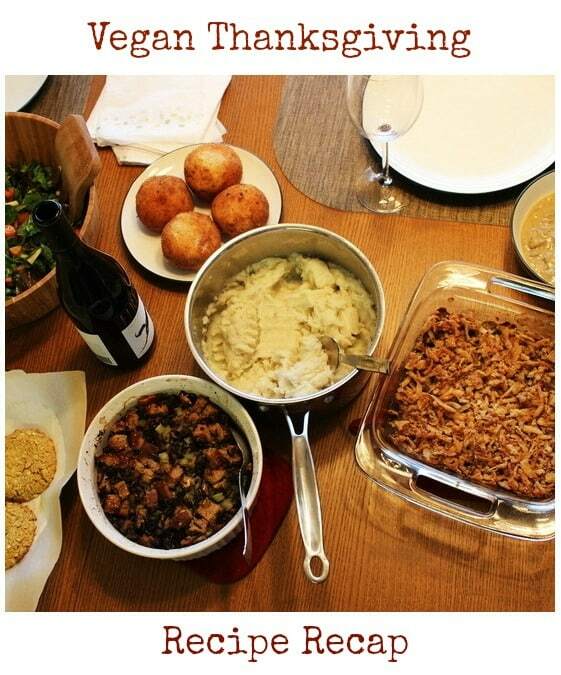 This is what our table ended up looking like – and that’s not picturing Thanksgiving mushroom gravy and Chocolate Peanut Butter Oreo Pie for dessert! 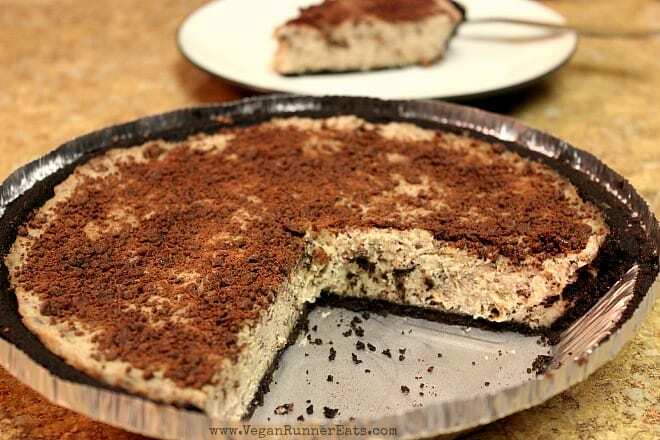 – And for dessert (not pictured), Rob’s absolute favorite pie of the year, Black-Eyed Pea-Nut Butter Pie, also known in our house as the Chocolate Peanut Butter Oreo Pie from The Great Vegan Bean Book by the vegan cookbook rockstar Kathy Hester. 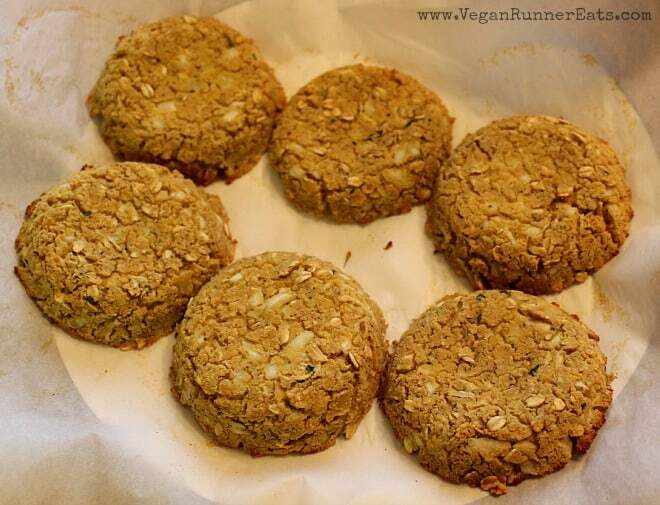 I’ve wanted to make this recipe from The Happy Herbivore Cookbook by Lindsay S. Nixon for a while, but was intimidated by the prep that had to start the day before making these patties. In particular, this recipe calls for a block of firm tofu to be drained and placed in the freezer overnight, which turned out not to be a big deal. Otherwise, the recipe proved to be less complicated than I thought. Defrosted tofu and a small parsnip were shredded in a food processor, and then mixed with the rest of the ingredients. The mixture was then formed into patties and baked in the oven for about 25 min (I didn’t really time them). Verdict: the patties turned out tasty but a bit dry, which was okay because I also made Lindsay’s mushroom-based Thanksgiving Gravy (see below) that is specifically designed to go with these patties. 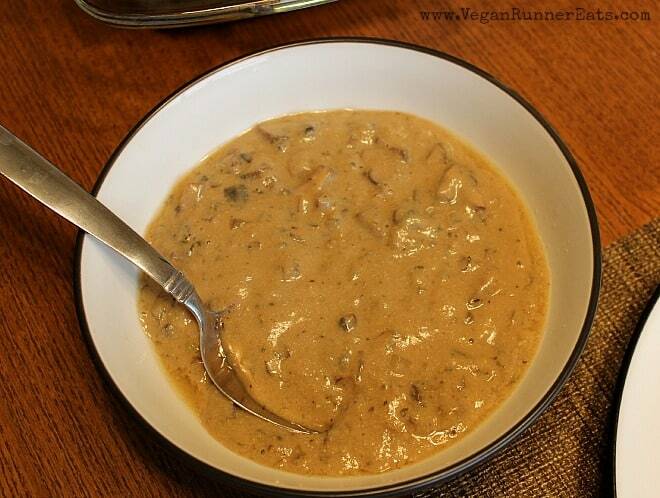 This mushroom gravy from the same cookbook by Lindsay S. Nixon is one of my favorites: I’ve made it before and could eat it by the spoonful. It comes together very quickly and doesn’t require a lot of effort, which is perfect on a busy day of cooking a Thanksgiving feast. The addition of sage and thyme brings out the flavor of the mushrooms, and nutritional yeast – a common ingredient of a lot of creamy vegan sauces – adds a delicious ‘cheesy’ hint. Verdict: gimme more! I’m especially proud of Rob because he made his favorite rice balls all by himself this time! The meat-stuffed Italian rice balls are a huge holiday staple of his family, and for him no Thanksgiving or Christmas has ever gone by without indulging in a few of these. 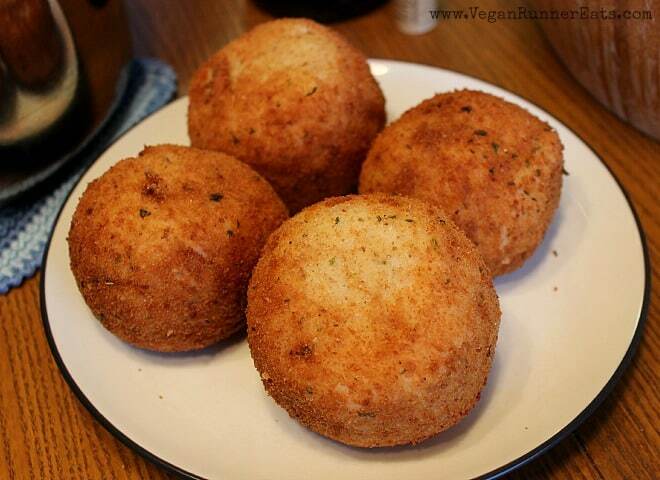 Luckily, last year we combined our efforts and successfully veganized these rice balls – you can see the full recipe here. This time, Rob simplified a few steps and made a quick stuffing from crumbled-up Field Roast sausages mixed with some extra spices and some pasta sauce. He also used a mix of almond milk and chickpea flour to stir into the rice instead of ground flaxseed – the latter smells a little bit like bleach to him. Verdict: these came out as delicious as ever, and the Field Roast stuffing was very reminiscent of the traditional meat stuffing of the original Italian rice balls. 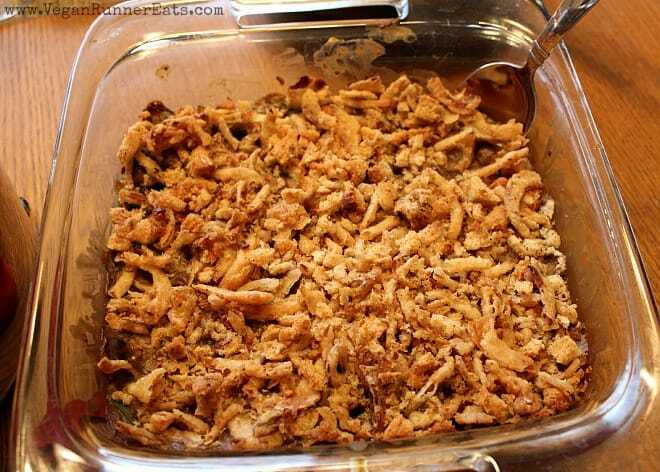 I’m not American originally, so I didn’t grow up seeing the classic green bean casserole on the holiday table. However, I’ve heard a fair share of jokes about this dish, especially due to the fact that it’s usually processed beyond belief. My usual thought about cooking anything is, ‘It has to be much better if made from scratch!’ So this Thanksgiving, I set out to make the American holiday staple armed with this recipe by one of my favorite vegan bloggers, Susan Voisin from FatFreeVegan.com. Trust me, there were green beans underneath! I have to admit, this casserole pleasantly surprised me. Not only did it turn out delicious, but it was also one of my favorite pre-dessert dishes on our table, and the first leftover dish to be gone in the following days. Of course, the French-fried onion topping had something to do with that… but the bean part was also quite tasty, baked in a mushroom-sherry gravy with just the right amount of spice. Verdict: Good stuff! I’d like to make this gravy again, and serve it on top of some steamed green beans or asparagus. 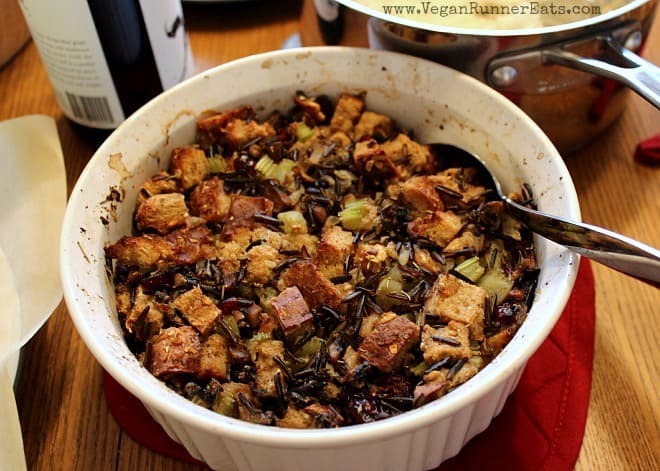 Stuffing is another holiday dish that I didn’t grow up eating, but the idea of making the perfect vegan stuffing fascinated me for the second year in a row since we went vegan. I found this recipe by Somer McCowan of the VedgedOut.com blog and decided to give it a try. Besides wild rice, cranberries and other traditional ingredients, the recipe called for pine nuts. However, when I saw the price of pine nuts in the bulk section of our local grocery store, my jaw almost dropped, so the decision was made to go without the pine nuts. I’ve got to admit: it’s either that I don’t know some essential tricks about making Thanksgiving stuffing, or that I added too much veggie broth (which was less than the recipe called for), but this stuffing didn’t come out the way I expected. The bread cubes were still too moist underneath the dried-up top level, but the overall taste was fine. I ended up mixing everything in the dish again after dinner, and put the stuffing back into the oven at low heat for at least another hour do dry up the soggy bread cubes. Verdict: my perfect stuffing still needs work. When it came to picking our Thanksgiving dessert, we knew two things: we weren’t interested in traditional pumpkin or sweet potato pies, and that we both were in the mood for something chocolatey. Our choice fell on The Black-Eyed Pea-Nut Butter Pie from Kathy Hester’s The Great Vegan Bean Book , which has been Rob’s favorite dessert in the past few months. In fact, he loves it so much that I can’t count the number of times I’ve made it since discovering this recipe earlier this year. The recipe is very simple: the delicious, smooth custard is based on cooked black-eyed peas blended with some peanut butter and a few other ingredients. The custard is poured into an Oreo cookie shell – not the healthiest thing to eat, but it’s okay every once in a while. One of my favorite things about this recipe besides its simplicity is the fact that it doesn’t call for lots of nuts (only some peanut butter) or added oil/fat like a lot of homemade vegan pies do. Plus, what other pies are loaded with protein and fiber from nearly two cups of beans? Verdict: this pie is absolutely delicious! I’ve made it before for my in-laws who aren’t fond of beans, and also for a local vegan potluck, and both times I didn’t reveal the ‘secret ingredient’ until after everyone tried the pie and declared it yummy. Rob now wants to bring this pie to work one of these days to show his coworkers that vegan food can be delicious too! 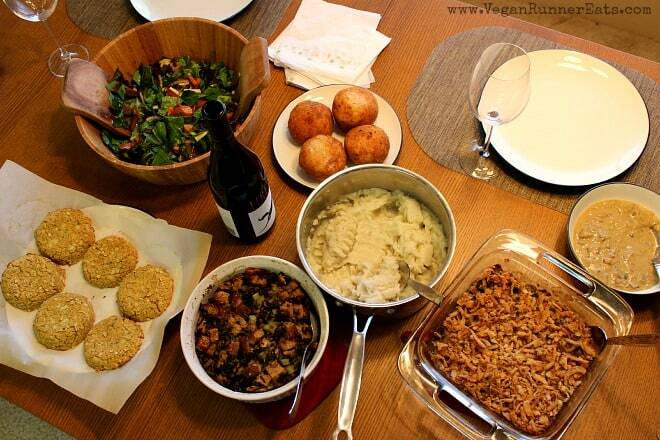 So this is my vegan Thanksgiving recipe roundup and review. There’s been a number of other recipes that I wanted to try, but I was graciously reminded that there would be only the two of us at our Thanksgiving table, so there was no need for me to stress out about the additional prep and cooking. I do intend to make a few more recipes from my Vegan Thanksgiving Pinterest board, so stay tuned for new recipe reviews! Also, if you’re new to my blog, check out the Tried and True Recipes series in which I review various recipes from all over the blogosphere, from breakfasts to main dishes and desserts. Tagged Fat Free Vegan, holidays, Italian, Kathy Hester, Thanksgiving, tried and true recipes, Vedged Out, vegan holiday recipes. Bookmark the permalink. I bought all of Lindsay Nixon’s books. I love cookbooks and I wish Susan Voisin of “fat free vegan” would publish her recipes. It looks like you had a wonderful Thanksgiving. Thank you for the recipes! Thank you Nadege! I love Lindsay’s cookbooks and cook from them at least a few times a week. And yes, I think it would be lovely if Susan from FatFreeVegan.com published a cookbook too – bet it would be beautiful, with all of the amazing photography she does! Thanks for the great round-up! I have The Great Vegan Bean Book, but haven’t tried that pie yet. I might have to put it on the Christmas menu. Terri, go for it, you’ll love it! I know, it’s easy to overlook that recipe because it doesn’t have a picture in the book, plus the idea of a pie with beans sounds weird. I was so glad I gave it a try, and Rob now requests it all the time!